BirminghamTV interview Harborne Royalty Trust. The Harborne Royalty Trust received the exciting news that we are to receive a grant of £4,520 from the Architectural Heritage Fund (AHF) to enable the Trust to engage professionals and undertake further research in order to test the viability of proposals for the Royalty building and then produce a Project Viability Report. The funding will enable the Trust to engage a Conservation Accredited Architect to prepare a Heritage Statement and Impact Assessment to accompany our proposals for the restoration and redevelopment of the Royalty Cinema. The Heritage Statement and Impact Assessment will inform HRT of what can and should be saved and restored at the Royalty, which in turn will provide the evidence for securing further funding as we move forward. We will also look to secure independent structural advice on the building. The Harborne Royalty Trust with our skills base, experience of development of community facilities, fundraising and finance, remains best placed to work in partnership with the owner and local authority to ensure a viable scheme comes forward. Funding such as the AHF has generously provided gives us the necessary funds to properly assess the restoration work required. Please download our latest Newsletter for up todate information on whats happening in March 2019. The Harborne Royalty Trust met with BCC, our local Councillor Peter Fowler, the owner of the Royalty Mr Parminder Singh and his advisors at the Council House on Friday 4th January 2019. The Trust was represented by Trustees Trev Norris (Finance) and Rob Vaughan (Conservation). The meeting was convened on a cross party basis but Councillor Jayne Francis was unable to attend on the revised date and sent her apologies. Going forward, continued site security and surveillance, further controlled demolition, making good and protection, and options on redevelopment will all be considered. An ‘Options Appraisal’ will be an important piece of work that looks at every option available. Whilst all options remained on the table, the scale of any development and viability would impact on this. A mix of commercial and community uses were likely. The Trust pointed out that being a ‘not for profit’ organisation, it would be in a unique position to apply for funding not available to a commercial developer. The Trust noted that currently it is the only group realistically able to deliver a community element and it would continue to work with the wider community, BCC and the owner. The Trust is now looking to review the remains of the building and take into account the structural report and then firm up options to bring forward a viable proposal based on the public consultation to present to BCC and the owner. We will be talking in more detail with those that have expressed an interest in using the building and with our financial and construction advisors. The meeting has now been scheduled for January 2019. We are anticipating that along with ourselves there will be Councillor Peter Fowler representing both our local Councillors (Councillor Jayne Francis), Parminder Singh the owner of the Royalty, Chris Pengilly and planning Officers. We have requested a copy of the structural survey in advance of the meeting but this has not been forthcoming. Until we have the survey and understand the extent of damage to the building it will be difficult to finalise how we might take the building forward. In the meantime we are continuing to expand the Trust skillbase and have ongoing discussions with potential users of the building who continue to come forward. We have been informed the scheduled meeting for the 31.10.18 has been cancelled as the structural report on the building was not yet ready despite over a month having passed since the fire occurred. We have sought more information and we have again offered the services of our RICS Certified Historic Building Professional, architect and a structural surveyor on a pro bono basis. We want the public to be confident that all of the building and Art Deco features that can be saved will be saved. At this point in time we think more information on the initial demolition work to make the building safe should be forthcoming and how remaining features will be recorded and salvaged. If we are to rebuild the Royalty, the Council needs to ensure this work is carried out to an agreed plan and closely monitored. At a meeting with Councillor Peter Fowler representing both our local Councillors (Councillor Jayne Francis) on this matter, we were advised there is to be a meeting towards the end of October to look at the future of the Grade 2 listed Royalty and options will start from the complete rebuild of the Royalty to complete demolition with options in between. 2 members of the Trust will be invited to attend. Its anticipated that by then a structural survey will be available to inform the amount of damage the building has suffered. More information in due course. With the consultation going so well the Royalty suffered a major fire which is being investigated as arson. The main auditorium looks to be gutted. The Trustees will continue to press on. Sadly one aspect of the restoration looks to be beyond achievable but the response to the consultation and reaction from residents has given us great encouragement that we still need to deliver for the local community. The next event was in the main Moor Pool Hall which provided room to put both displays of visuals up. Another good turnout and more helpful suggestions and ideas. The Consultation started with our first event at the Harborne Club in Albany Road on Saturday 15th September. We are very grateful to the Club for providing their venue free of charge. The event was in effect a warm up but well attended and we had many useful comments and suggestions. The visuals were extremely well received. The funding agreed last year from Birmingham City Council finally arrived in our bank account so we can complete the consultation proposals. We are working closely with our architects looking at further exciting options for this building. Meanwhile we are being approached by a number of different commercial users keen to discuss how we could partner together to deliver the great opportunities this building provides. 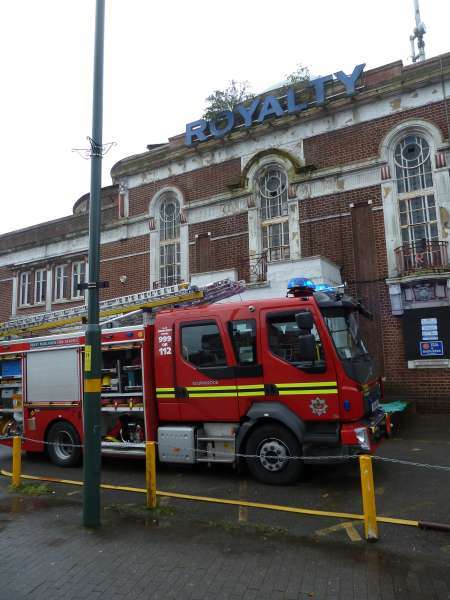 Some of you already know but doubtless will hear the news that there was a fire at the Royalty this morning. The Fire service were called about 7.30 and I spoke to the officer in charge just before 9. The fire was contained and was in front of the stage area. It hadn't spread and the damage was not too severe. There was still smoke clearing from the building when I was there. Apparently an electrician had arrived early on and found the front door open with individuals inside who were abusive. The fire was reported after that. The building is clearly not secure enough. Apart from this there is ongoing damage to the listed features and the Council seems content to stand back and watch this happen. Please feel free to make your feelings known to our Conservation Officers through you local councillors or online at PlanningandRegenerationEnquiries@birmingham.gov.uk Click here for local link details. Thanks to everyone who has contacted me about the fire. HRT welcomes new Board Member Trevor Norris. Trevor has extensive skills in business development and finance which will enable HRT to look at a wider range of options to take the Royalty project forward. HRT are in discussion with our architects to develop the consultation proposals and also look at additional community space opportunities. HRT welcomes new Board Members Jodie Cartwright and Rob Vaughan. Jodie works for a national energy company focussing on public consultation. Jodies skills will be of great assistance as we finalise the HRT pulic consultation. Rob is a Chartered Quantity Surveyor and RICS Certified Historic Building Professional. For the past 10 years Robs work has focussed on disaster recovery specific to historic and listed buildings. HRT welcomes new Board Member Alison Solomon. Alison has worked in a producing theatre with A list and jobbing actors; MD's; international directors; casting directors from the RSC, Royal Court, The National and West End, working with some of the top names in theatre, writers and creatives. Alison also has community arts training /experience and current practice with leading and multicultural organisation nationally delivering arts, crafts to the youth, elderly, mentally ill, Dementia & Alzheimer's patients and culturally diverse people. Download the second edition of the Harborne Royalty Trust News. A busy month. HRT has made an offer to the owner for the building, received a £5,000 Local Innovation Fund grant from Birmingham City Council and given a talk to U3A at the Quinborne Centre. The Board are also pleased to welcome 2 new Board members, expanding our skill base further. Katy Ross is a chartered accountant with a leading top 4 accountancy firm. Lizzie Hayes works for a local authority as Strategic Investment Manager; managing grants programmes working within the Community Investment and Partnerships team, supporting charitable and voluntary organisations to grow and thrive and enabling them to become sustainable community resources. The owner has received planning permission for a car wash on the car park and this was supported provided income is used to secure and protect the building and the restoration of the building is not impeded. HRT had a stall at Harborne Farmers Market. There was an excellent response from the public with many people coming forward to pick up information and look at the pictures of the building. All the response was positive with many views expressed that more apartments were not needed and the restored Royalty would be a big plus for harborne. Download the first edition of the Harborne Royalty Trust News. HRT along with other applicants presented their application under the Local Innovation Fund grant scheme at the Harborne Ward meeting. In particular HRT pointed out the substantial investment of over £5 million the scheme would bring to Harborne High Street but also the 40 - 60 jobs. This is real innovation by members of the community and we hope that the funds provided by council tax payers for intiatives like this fund will be used to support the opportunity of real delivery for Harborne. The Chair asked at the end of the meeting for a show of hands in support of the various projects and the Royalty was given strong support. The Chair of HRT despite other commitments was able to attend part of a meeting at the Slug and Lettuce in Harborne to discuss recent issues at the Royalty. The plans for 3 screen cinema, restaurant, cafeteria and community space were explained and the fact it was not all about cinema but people using the building for other purposes including the restaurant and community facility. Also explained was that film showings were not just main stream films but specialist film focussed on serving other groups including schools during the day. HRT wish to retain car parking but it will be a planning consideration, that the City will need to consider carefully and the public must have their opportunity to express their views. Security of the building was discussed. The Fire Service had recommended only the ground floor was boarded up, so anybody inside could escape from upstairs. The suggestion of temporary occupation was brought up (something we had suggested at the 15.03.17 meeting). HRT considered this acceptable provided it was not used as a back door precedent for residential development. HRT suggested that as part of an HLF funding application expenditure to secure the building might be possible. HRT asked Ben Plenty the city planning officer whether the City could advise on boarding up as they undertook this to several of their own properties. The car wash had been closed down because of local complaints and there had not been planning permission. HRT stated whilst any options remained available to save and restore this building, HRT would pursue them; that our original intention was to use the building as a community hub and this was still a consideration, but that working with our commercial partner was a better option, but not the only one. A meeting is scheduled with BCC Planning. the owner and the HRT team to discuss ways forward with the Royalty. A number of breakins are occurring at the property and the Chair of HRT has been contacted by the Police to discuss proposals for the building. Sergeant Khalil was advised HRT were willing to meet at the earliest opportunity to discuss this and provide an update on the restoration plans. Copied in were local Councillors, BCC planning and Gisela Stuart MP. As a listed building its crucial this building is properly secured. The plans for the restoration of the Royalty as a 3 screen cinema with restaurant, cafetieria and community space were presented at the Ward meeting to local Councillors Jayne Francis, James McKay, John Alden and members of the public in support of an Innovation Grant funding application. Questions were answered from the public one of whom requested a show of hands in support of the project. Ths was approved by the Chair and an overwhelming response in favour resulted. Meeting with Harborne Society to update on the Trusts aspirations and progress so far. Plans for the cinema option were explained. Formal response from BCC planning department now received confirming '......The City Council support the retention and reuse of the existing building, such a scheme (as we propose) would receive the wholehearted support of the LPA'. The above comments are made without prejudice to any final decision made by the local planning authority (LPA). Formal response to pre application meeting with Historic England received "We welcome this proposal and we consider it an excellent approach to preserving the historic fabric and architectural forms and to find a sustainable use for the building". Meeting with Historic England at which we discussed our proposals for the restoration of the building. Reaction very positive and we are now moving forward with them so that we can enter more formal discussions through our architects as our designs become more detailed. It's rather mundane but our banking facilities are now confirmed. Important though, because for most grant applications an account number is needed. Not all good news. The access we need to carry out the building evaluation is being refused, which is a great pity. This is a great opportunity to save and restore this building. It would be totally wrong to leave it in its present state. The Royalty and Harborne deserves better. Let's hope sense prevails and all those such as our Councillors, MP and Societies exert whatever pressure they can to ensure we continue to make progress. Further discussions are taking place with various supporters. The Cinema Theatres Association are keen to see this building brought back to life. We are discussing with our architects how cinema, community use and heritage education can be combined as part of the restoration. What an opportunity for Harborne! We now need to do a full technical evaluation on the building so that we can complete funding applications. We plan to submit an HLF Enterprise Grant application which requires substantial detail. We already have quotes from our architectural practice that has particular expertise in the restoration of listed buildings, service engineers, structural engineers etc. The application will be detailed as the contribution the Harborne Royalty Trust will be making will be substantial. The press have the story about plans to bring the Royalty back as a cinema after the conservation panel met. 'Glorious Return For Silver Screen'. We didn't want to build up expectations whilst discussions with the planners were ongoing but cinema is now a real option. The story has appeared in the Birmingham Post and Mail and has prompted even greater interest in saving this iconic building. When people said how great it would be if cinema could return to Harborne, little did they know how close to this possibility we were getting. More volunteers are coming forward all the time. A sub-committee is looking at the history of the building, finding out about the films shown, art deco, projection history and annecdotes from users. Another article after an interview with Board Member Adam Fraise. We have made our pre application and met with senior planners and conservation officers at Birmingham City Council. The plans were well received and a presentation to the Conservation panel is to be arranged. As we understand it the Conservation has an advisory role on guiding the planning committee when important heritage issues such as the Royalty are at stake. The Trust are very pleased with the reception we were given. A new future for the Royalty. Today we made a pre-application submission to Birmingham City Planning Department. The details will remain confidential but our plans can secure this iconic building for the future. We have submitted formal expressions of interest to the owners' agents and are determining the conservation deficit in order to determine the value the Trust will seek as part of an HLF Enterprise grant application. Architectural drawings are being drawn up and evaluated prior to a pre-application planning application being made to Birmingham City Councouncil Planning Department. We are in touch with senior officers and they are aware of our plans to secure this important local asset. Dependent on our review of our business plan and the result of pre application discussions with BCC, we will then move to the next stage of public consultation and a formal planning appplication. We have begun the process of engaging with our Councillors, MP and local groups to ensure they are aware of the options and can contribute their views and suggestions as the process develops. We are developing an appropriate Articles of Association governing document for a Royalty Preservation Trust which would also secure charitable status.